The HPE600 package costs customers $19,950. 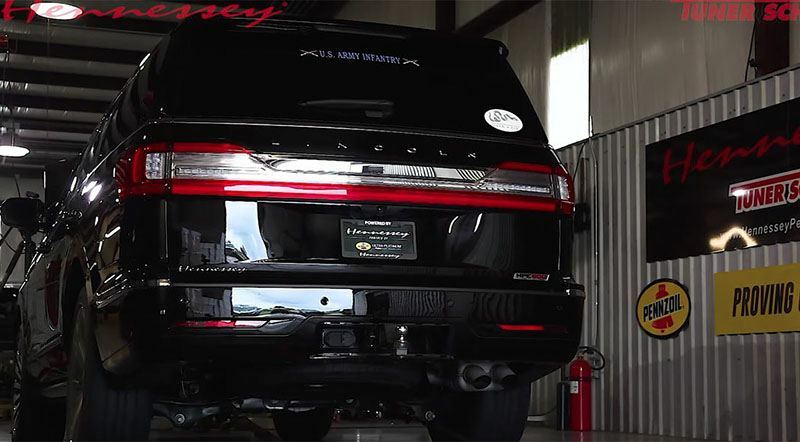 True to its promise, Hennessey Performance Engineering (HPE) has built Hennessey Lincoln Navigator producing 600 horsepower, which is 150 more than what the standard version offers. To opt for the HPE600 package, the customer has to provide either a Navigator or an Expedition Platinum model. To boost the engine power, HPE had to install a high-flow air-induction system, a turbo wastegate modifier, a front-mounted upgraded intercooler, stainless steel cat-back exhaust, and engine software. The HPE600 package costs customers $19,950, however, those having deeper pockets wishing to get more upgrades can also opt for lowering kit, Brembo front, and rear brakes, and 22-inch wheels with performance tires. The Hennessey Lincoln Navigator has experienced 200 miles of testing. Hennessey says it can run to 60 mph in just 4.8 and cover a quarter-mile in 12.9 seconds. HPE has been providing modifications for GMC SUVs for years but this is the first time they have put their hands on the Navigator. We can also expect an HPE800 package for Navigator if this treatment gets popular.